Simplify your life with our checking: no hassles, no fine print disclosures, no strings attached, and no limits on good service. Dividends are paid on a monthly basis. 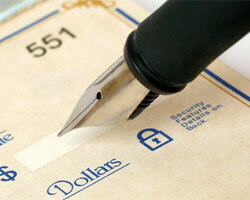 Write as many checks or make other withdrawals, as your account funds will cover. The PC Branch is real-time data! You can see what has cleared your account in addition to other cool credit union services. The convenience of online banking with PC Branch or the 24 hour Southern Express Automated Teller Service connects you to your account status immediately. Your first 50 checks free. If you need a checking account, choose Southern. If you want better checking, switch to Southern. Apply online now. Give us a chance to wow you! To obtain a debit card through Southern Credit Union, you must have a checking account. You will also need to complete an application and meet credit criteria. We offer VISA debit cards and they work anywhere VISA is accepted. Although we do not have our own ATMs, there are several surcharge free ATMS that you can use and avoid those pesky fees! Look for the Co-Op Network logo on ATMs. The fee will be waived at these machines. See our other surcharge free ATM locations. If your card has been lost or stolen after business hours or on a weekend, call 1-866-546-8273 to block activity. You must also notify the credit union in writing when your card has been lost or stolen.